Kartridge, the upcoming PC gaming platform from Kongregate, is partnering with an all-star selection of developers including Double Fine, Versus Evil, and Ninja Kiwi to bring over 100 games to the highly anticipated open beta, coming later this summer. The growing beta Kartridge catalog includes a robust combination of new and legacy titles from legendary and indie game developers, and will also include Kongregate-published titles and fan favorites. Nearly 50 developers have committed to bringing their titles to the Kartridge platform, with more coming daily. Double Fine’s collection of cult classics, including Psychonauts, Day of the Tentacle Remastered, and Brutal Legend, will be available alongside Banner Saga 1 & 2, Antihero, and Guild of Dungeoneering from successful indie development team Versus Evil. Asymmetric is bringing the award-winning West of Loathing, and Ninja Kiwi will continue their close, long-time partnership with Kongregate with the additions of Bloons TD 5 and Bloons TD Battles to the new Kartridge platform. 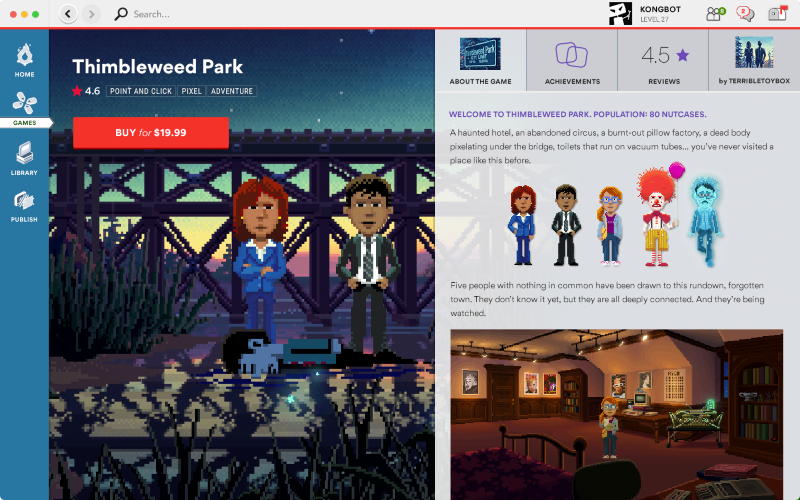 The beta library is packed with new and beloved titles from many acclaimed independent development studios, including Ironhide Game Studio, Thunder Lotus Games, and Thimbleweed Park’s Terrible Toybox. Kongregate’s early work with developers has been an integral component of the beta process (Kongregate is the developer of the Kartridge platform). While a number of these titles are already available on the closed beta platform, they will continue to work with developers who are interested in porting additional titles not yet disclosed. Kongregate’s premium publishing program, including the recent reveal of Speed Brawl, will also bring additional marquee titles to the platform during open beta. Kartridge recently announced developer-friendly revenue share terms that include a 100% revenue share on the first $10k in earnings and also a 90% revenue share for exclusive titles on their next $40k in earnings. Additional information on exclusive titles will be forthcoming.